Pocket Penguin(s) performed for a tea time concert at AGE UK. 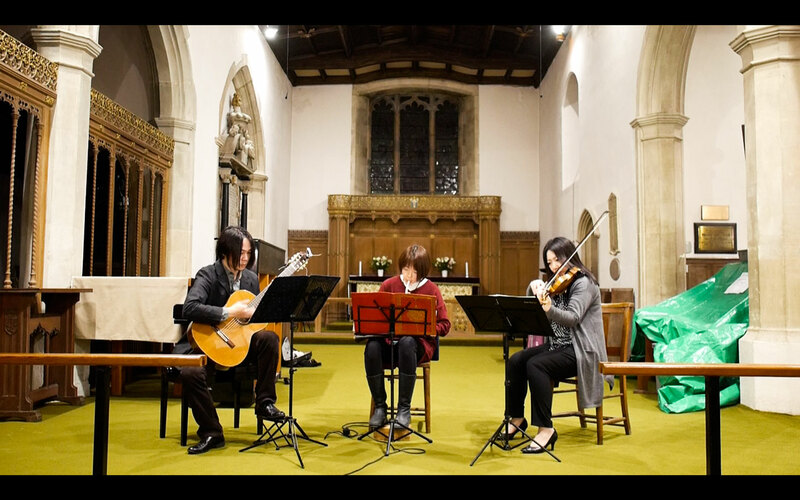 There were about 50 elderly people and we could play in a very warm and nice atmosphere. We especially enjoyed their participation with singing for Hymn from Jupiter. Thank you very much and we hope to come back again. Thank you for coming all the way. We really had a great time to perform and hope you all enjoyed as well. 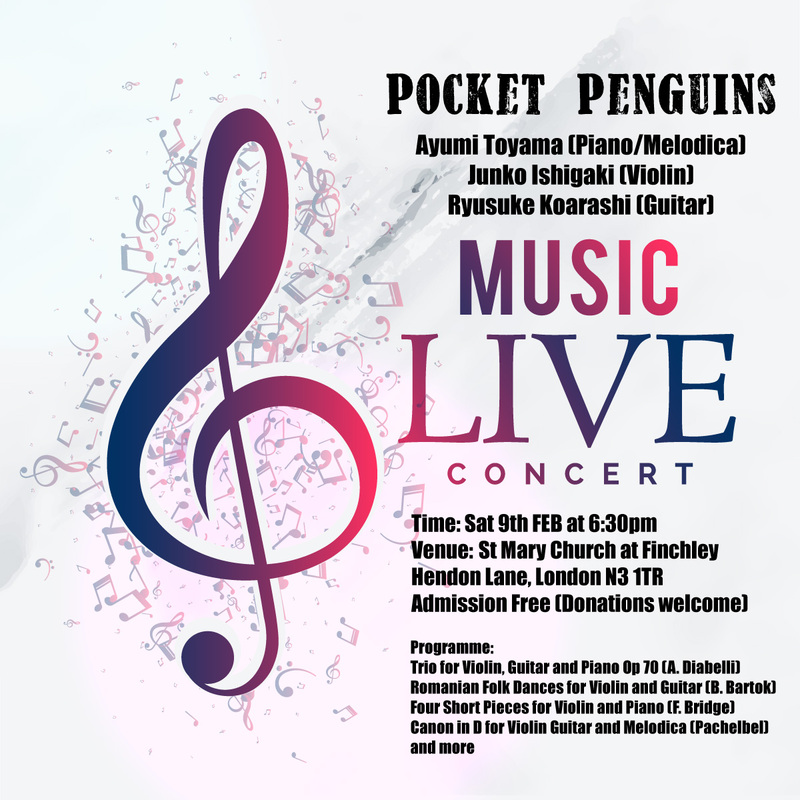 Pocket Penguin will be performing with a violinist, Junko Ishigaki. Hope to see you there. Melodica club is going to have a concert in next month. The programme will include repertoires in quite diverse styles as Renaissance, Baroque, Classical, Film, Jazz, Bossa nova, and more. Fee: Admission Free (Donation Only) Free drinks will be provided. The score of ‘The Merry-Go-Round of Life’ also became available to purchase from here (Japanese). 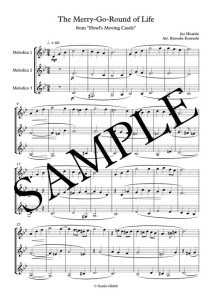 This piece is asked to arrange by a member of Melodica club to include in the ensemble’s repertoire. I arranged it rather polyphonically as well as Carrying You, to make it idiomatically more effective and enjoyable for all the players. Three parts seem to work very good for melodica ensemble, when the register of the instrument is quite limited and the timbre is very sharp and prominent—that can crush in their overtones making a dissonance, whilst three is the minimum number that still can keep “triadic structure”. Please feel free to ask us if you have a problem for purchasing with their translation of Japanese. The score of ‘Carrying You’ became available from here (Japanese). I initially started to arrange this piece for our students (kids) to play, but as it eventually became a little more complex beyond their ability, it is played by Melodica ensemble that we organise in London. 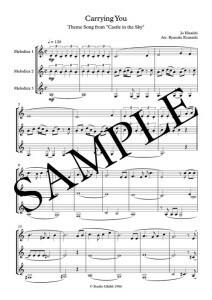 The original texture by the composer, Jo Hisaishi is rather monophonic—melody + accompaniment, but I made it more polyphonic using devices such as counterpoint, imitation that seems idiomatically more effective for melodica ensemble. And that might be more enjoyable for multi-players. Please feel free to ask us if you have a problem for purchasing with their translation of Japanese. From the end of 2014 to the beginning of 2015, Ryusuke was back in his hometown in Japan after two years. 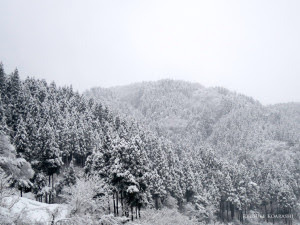 It was snowing heavily there. 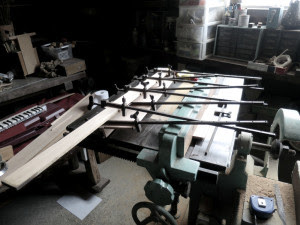 After finishing concerts in Aichi, he spent his time for making melodica’s cover of wood with his fathers help. 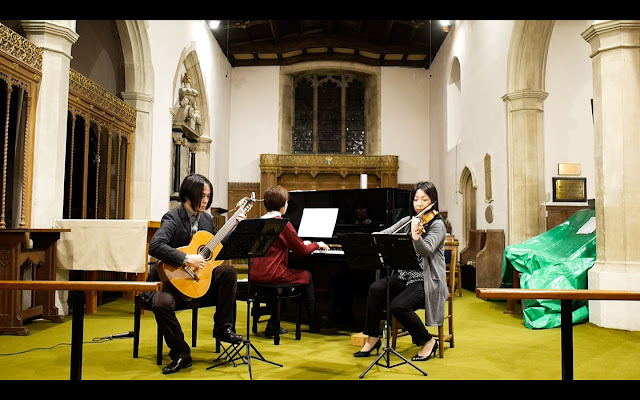 We have been very interested in using different material, especially wood, for melodica, Ryusuke once tried to make a wooden cover in London in 2013, however we did not have enough tools and good material either, so he eventually stopped just before completing. Wood is probably the one of the most popular and general material for making musical instrument, even in when we can choose from most diverse materials. 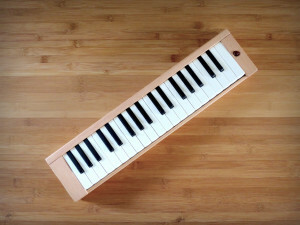 Currently (Jan 2015) most of the melodica on the market are made of ABS, but on the other hand, the wood pattern design on Hammond 44 or PRO-32 V2 by Suzuki seems to represent an admiration for the material by the maker or performers. There were several wooden boards propped against the wall of his father’s studio, the wood we chose for this time was probably around 100 years old counting its dense grain, perhaps a kind of Hinoki—a Japanese (or taiwanese?) cypress, but it does not have Hinoki’s characteristic fragrance very much. According to Ryusuke’s father, the material has been there in the studio when the town was flooded in 2004, so at least for ten years. It is very hard to make melodica from the scratch, so this time we just made the outside cover with ready-made one(inside). The working process eventually took 5-6 days. The first thing the sound tells us is that the reed decisively determines the timbral tendency that is not changed fundamentally by the outside cover. The second thing is that the wood may not always produce good, or desirable tone, even plastics might do better (here we are not saying the result of wood was bad). The tone heavily depends on what wood it is (obviously wooden material is hugely diverse), and its structure. Mere 1mm can make considerable difference on harmonic structure. Perhaps Using wood as a single material is not enough, but perhaps mixing different material is needed to reduce unnecessary harmonics. Such thing is presumably obvious for maker/player of concertina—an free reed instrument belonging in same family with Melodica, they have been making very much elaboration to acquire their desirable sound. Throughout making, there remains many subjects on structure and material, but the timbre came to close to what we want, so we are satisfied as the first work. Regarding its timbre, we heard several people resembles it an organ (Reed organs were used for music class in primary school in Japan). The details about its timbre will be in later article. Pocket Penguin. Simple theme. Powered by Blogger.